America is a tossed salad of languages. How do Americans learn foreign languages? How do students become bilingual? When should children learn a second language? Is foreign language an elective in California? When do students in other countries study world languages? How can students earn the California Seal of Biliteracy? California's population has grown through immigration from all over the planet, and its students reflect that diversity. America's multi-lingual character has everything to do with the recent history of immigration. Unfortunately, it has rather little to do with education that children receive in schools. Learning a language takes time. But few American K-12 school systems seriously embrace the multi-year work of preparing students to build proficiency in a language other than English. Mastery of a second language is simply not expected of most American children. This is quite a blind spot. Patricia Kuhl studies language acquisition in babies. She has found that children learn the sounds of language very early, and that the aptitude for identifying the sounds of language declines sharply with age. Her TED Talk on the subject is well worth watching. In the last two decades, China has transformed itself from being economically isolated to being vitally connected to every part of the world market, including America. Arabic-speaking countries have become vitally important to America. But few American students even have the option to learn these languages during their pre-teen years, when they are linguistic sponges. California requires zero years of world language instruction in elementary and middle school. Research on language and brain development finds that until about age six or seven, children are “linguistic geniuses”. This ability steadily declines as you grow older. It is incredibly important to start to learn a second language when you are young. America's current tendency to leave world language instruction to middle and high school years is devastating from the perspective of results. Most nations require foreign language instruction in several elementary and middle school grades, when kids are good at learning them. California requires zero years of world language instruction in elementary and middle school. Many California school districts require students to study a world language for at least one year, though the state does not require it. To qualify for a public four-year college in California, students must take at least two years of world language in high school. Even though California's original state constitution was written in both English and Spanish, public opinion has not always embraced multilingualism. Proposition 227, passed in 1998, required that most classes in California be taught in English. This initiative was overturned by another, Proposition 58, in 2016. The new rules remove some obstacles to creating a bilingual or two way immersion program in your school. They also should contribute to demand for multi-lingual teachers, which are in short supply. 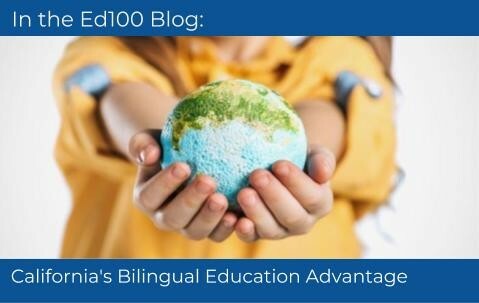 School districts with large numbers of English Language Learners are recognizing the bilingual advantage and creating more dual language learning opportunities, a topic we explore in more detail in the Ed100 blog. California is attempting to embrace second language learning. In 2018, the state passed a law to use the term "world language" in the education code. This change is a nod to the huge diversity in the state and an effort to be more inclusive. This change recognizes that there really is no “foreign” language in California. The state took another symbolic but meaningful step to highlight the value of knowing multiple languages by creating The State Seal of Biliteracy. This program recognizes high school graduates who have attained a high level of proficiency in speaking, reading, and writing one or more languages in addition to English. In 2018, more than 55,000 students earned this seal on their diploma. By 2030, the California department of education hopes to expand this number to 150,000 students through the Global California 2030 program. If you want to request seals for graduating students at your school, you need your school district to use the request form. America has a long history of "assimilating" immigrant groups, including linguistically. Preserving the language skills that immigrant children bring with them has not been consistently viewed as important. For decades, "foreign" language instruction, when offered, was an academic elective. For English speakers, some languages are more difficult to master than others. According to the Foreign Service Institute, which trains American diplomats, it takes an average English speaker 2,200 hours to become proficient in Mandarin or Arabic, but only 600 hours to learn Spanish, French or Italian. And the hardest language in the world for native English speakers? Japanese. The written language uses ideograms based on Chinese characters, but the characters can be pronounced in different ways depending on context. It also features nuances to express humility and respect that flummox many Americans. The California Association for Bilingual Education (CABE) provides great resources for parents and teachers. Some school districts in California have developed robust dual language pathways, including San Francisco Unified. Speaking in Tongues: 4 kids. 4 languages. 1 city. 1 world is a documentary that follows four San Francisco students as they become bilingual. The American Council on the Teaching of Foreign Languages offers tips for parents who want to advocate for language programs in their communities. Looking for ways to support your student learning a second language? Check out this article from GreatSchools. More research on the benefits of bilingualism from the New York Times: The Superior Social Skills of Bilinguals. Children learn languages most readily and fluently before puberty. How many years of foreign language instruction does California require schools to provide for students in grades K-5? Any of us who learned a language young (French in my case) knows that adding other languages even if not related to the first (ie German if you started with any Romance language) is easier as one reader commented already. I would add that I started early because my mother came in to my second grade class to give us some French (I believe it started formally in 3rd or 4th grade). And at the elementary level, it can be training the ear with the accent by learning songs, simple dialogues and so on; grammar can come in gradually as it does with English language. I don't happen to be a fan of immersion as a way for most to learn languages in school, as I feel strongly that knowing your home country language very well is critical. So I prefer the some every day approach (I don't think that qualifies as "intensive")--having your ear attuned 5 days a week accumulates wonderfully. "Research suggests that linguistically integrated dual-immersion programs work best for ELs. These “two-way” programs enroll roughly equal numbers of native English speakers and native speakers of the other language." I fully support children learning a different language early on; starting in Kindergarten. At that age, children are sponges and learn rather quickly. In Europe, kids graduate high school knowing at least three languages. Based on my own experience, being fluent in Spanish tremendously helped me learn the French language in school. Take a closer look at the research on the brain benefits of bilingual education. An article from NPR--How Learning Happens-- finds good news in the areas of attention, empathy, reading, school performance and engagement. There are also some long term benefits-- protection against cognitive decline and dementia. Thanks everyone for reading this closely and spotting some glitches in this beta version. The choices in the review question above will be modified to add one more option. That option will be 4. zero. Then you will be able to select the right answer. This is the second questions on here that has no answer. How can elementary school have these opportunities? Our school district has a Two-Way Immersion Charter School to offer the option for students to learn Spanish. It's an amazing program! Of all the skills that schools can teach, this seems like the one set of skills that genuinely deserve to be called a 21st century skills. As if the justification for being multilingual wasn't enough that it helps kids be more academically and culturally adept in our global economy, recent research underscores that fluency in multiple languages increases core cognitive functioning.